No. 18, Jalan Taming Tiga, Tanming Jaya Industrial Park, 43300 Balakong, Selangor, Malaysia. BSM Machinery originally established at 1979 located at Sungai Besi. We moved to our latest business premise at Taman Taming due to expansion of business. We are one of the leading woodworking machinery & equipment suppliers in Malaysia . 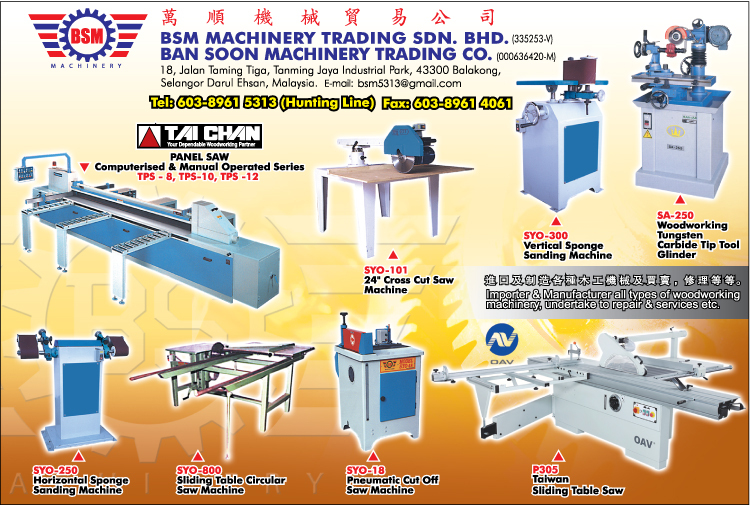 You can find a wide variety of woodworking machines with high quality and reliability in BSM Machinery Sdn Bhd. Our more than 30 years experience in this industry make us the expert's source for woodworking machinery. We have the latest table saws, band saws, scroll saws, mortisers, jointers and planers for you to choose from. We have a huge selection available. 5. Customers-Focus is our core belief- Customers' feedback is precious for us.